Nathusius' pipistrelle is small (wingspan of 220-250mm) and usually uniformly coloured brown bat with dark snout, ears and wings. It is quite similar to other Pipistrelle species with the exception of its 5th finger which tends to be longer (e.g. than 43 mm). Although slower than P. pipistrellus, P. nathusius still enjoys a rapid flight, which is helpful while foraging. This species' diet consists mainly of flying insects, such as non-biting midges, mosquitoes and black flies. It favours habitats of riparian forests, mixed woodlands and often close to waterbodies. During summer P. nathusius roost in tree holes, buildings and bat boxes, while in winter it prefers to hibernate in crevices in cliffs and cave entrances. 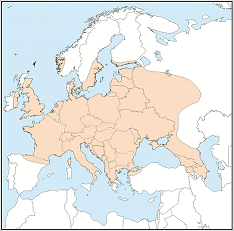 The Nathusius' pipistrelle undertakes a seasonal long-distance migration, usually from northeast to southwest Europe, along the coast or river valleys. It is restricted to Europe, Asia Minor and Transcaucasia where it is found up to 63°N. . In the Mediterranean, it is generally widespread across southern Europe although apparently absent from most of Iberia. It's long-distance seasonal migration causes the species to also occur on Corsica, Sardinian, Sicily and Peloponnes. Although not major threats, the species is affected by habitat fragmentation on migration routes, loss of and disturbance to roosts in buildings, loss of mature trees with cavities and/or loose bark, etc., and water quality changes which may affect food supply.